While not a make or break moment, this weekend does mark the first significant test of our likely Star Wars dominated future, as Disney's ambitious plan for the Star Wars franchise starts branching out beyond the “core” films. And yet even with a film likely to dominate the landscape this weekend, other films launch in an attempt to claim some land ahead of the lucrative Christmas week. The first Star Wars spinoff is not all that ambitious of an idea, to be honest – Rogue One goes back to juuuust before the start of the original Star Wars, detailing the work that went into stealing the plans for the Death Star that C-3PO and R2D2 carried to Tatooine. While a few characters are familiar, including Jimmy Smits as Bail Organa (carrying over from the prequels) and a tease of Darth Vader, it's mostly a cast of new blood, showing the opening days of the Rebellion against the Galactic Empire. Felicity Jones stars as Jyn Erso, a young rebel whose father (Mads Mikkelsson, in his second big budget villain role of the fall) designed the Death Star, leaving her potentially well positioned to lead a team designed to steal them away – look do you have a better idea? 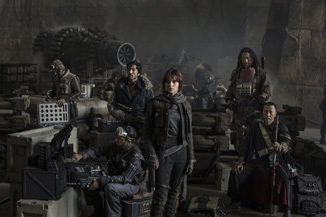 Anyway, her ragtag group of hope-filled hopey scruffy rebels full of hope, including Forest Whitaker, Donnie Yen, and a bunch of small-time names you've never heard of and who naturally can't carry on much further in the Star Wars universe lead an assault on various Imperial positions to that end. It's much more of a war movie than any of the previous entries of the Star Wars (....hey hey HEY) franchise, which is both better and worse – it's not weighed down by having to create canon of its own, but can't reach the mythic heights of some of the other films.